Even after ascending to the position of #1 contender in 1977, Marvin Hagler’s title shot was not forthcoming. His wait as the division’s top challenger – lasting over 2 years – became the longest in middleweight history. Hagler went unbeaten through 20 fights between 1976-79, then, finally, in November 1979, the muscular, 5’9″, versatile “boxer-puncher” did get his chance to challenge for the middleweight crown. The fight itself – against Vito Antuofermo – was officially, controversially, declared a draw, but with the majority of the boxing fraternity believing Hagler had done more than enough to win. Surprisingly, Marvin’s second title attempt came more quickly (although he had to travel to London, UK, to get it) – this time he seized the opportunity, stopping the champion, Alan Minter, in the 3rd round. 33 years later, on June 29, 2013, Gennady Golovkin – the The Ring’s #2 rated middleweight – unleashed his calculated, violent, “Mexican style” on #6 rated Matthew Macklin, digging a savage left hand blow to his liver, sinking the Briton to the canvas, and elevating himself to #1 in the ratings. A chance to challenge the lineal champion, the Argentinean, Sergio Martinez, was within his sights, or so it seemed. It’s been over 3 years since Gennady became The Ring’s top middleweight contender. His wait for a fight with The Ring champion has already been longer than any other middleweight, ever, including Hagler’s. The Ring champions – Sergio Martinez, Miguel Cotto, and Canelo Alvarez – have, pathetically, only defended the middleweight title a combined total of four times in the last 3 years. Worse still, each fight was fought at a “catch weight,” – not at the actual middleweight limit of 160lbs. Golovkin has been ostracised. The lineal middleweight title, which has almost always been synonymous with The Ring middleweight title – once held and defended by great fighters such as Jake LaMotta, Carlos Monzon and Bernard Hopkins – is in tatters. In this same period of time GGG has demonstrated how a champion should perform: he has blitzed through eight opponents – none of whom heard the final bell. All eight fights took place at 160lbs – no “catch weights” were needed. The #2 rated Australian, Daniel Geale, and #6 rated Martin Murray, were stopped for the first time in their professional careers. The IBF belt holder, David Lemieux, lost every minute of every round before getting stopped in the 8th. Eubank Jr. startled most people when he bravely threw down a challenge to Gennady at the beginning of the year. For a brief spell his bravado clogged up social media, yet when the contract was reportedly ready and waiting to be signed, the machismo vanished, along with his pen. The middleweights have scarpered, hence the reason welterweight, Kell Brook, is stepping into the ring with Golovkin on September 10. Burley had almost 100 fights and was never knocked out. He beat future world champions, Fritzie Zivic and Archie Moore, and was ranked in the top 3 at 160lbs in 1942, as well as 1944-46. He was not always the most consistent, but when on form, Archie Moore – who shared a ring with Ezzard Charles, Rocky Marciano and Muhammad Ali – said “Burley was the best fighter I ever fought, and the best fighter I ever saw.” Moore lost a 10 round decision to Burley in 1944, getting dropped four times in the process. “Burley gave me a boxing lesson,” he said. When the history books say that even the masterful Sugar Ray Robinson and Billy Conn steered clear of him for being “too risky,” it is clear Burley was a special fighter. A special fighter, sadly, who was never given the chance to fight for a world title, and eventually became disheartened with the sport, retiring at the age of 32. “Avoided” is an overused word in boxing, but Burley, Hagler, and now GGG are arguably the three most avoided middleweights in prize fighting history. Nationality? A limited grasp of the English language? Skin colour? Whatever the reason, all three men were not deemed marketable enough to secure “the big fights” for a large portion of their careers. This factor, combined with being supremely skilled and incredibly difficult to beat, meant the queue to fight them was often non-existent (and continues to be for GGG). 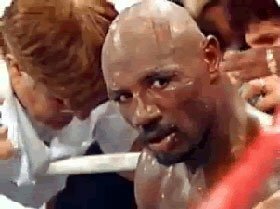 Hagler was avoided, but at least his opportunity eventually came, and once taken, he used his newly claimed status to entice his era’s super star welterweights, as well as the top 160lbs fighters, into fighting him. If Golovkin becomes the first man to KO Alvarez, golden doors will open, and the risk for squaring off against him may suddenly, magically, be worth the reward. The retired “Money” Mayweather – even in 2015, displaying virtually no evidence of deterioration – would definitely take notice. Worryingly for Gennady’s boxing legacy though, time is running out. He is 34 years old and still does not have a Hall of Fame worthy opponent on his ledger. Burley, like Golovkin, was a gifted prize fighter, but the “avoidance” he experienced means he is not remembered in the same way that some of boxing’s legends are. Will Saul Alvarez ever give GGG the fight he deserves? The Mexican’s reputation is being severely tarnished the longer he avoids Golovkin. *The Ring rankings have been referred to in this article.